Residents of Auburn, Roseville and many more have the opportunity to raft local. The American River is home to beginner, intermediate and advanced whitewater and it’s less than an hour’s drive on Hwy 49 or Hwy 80. Start off a family or group tradition by taking an introductory trip on the Class III rapids of the South Fork. If the kids are under eight years old, try our Tom Sawyer Float. The Middle Fork American, winding its way through a “Wilderness” canyon down to Auburn State Park, is right in your backyard and waiting for you to take the intermediate plunge in some Class III / IV whitewater. Up for a challenging Class IV adventure? 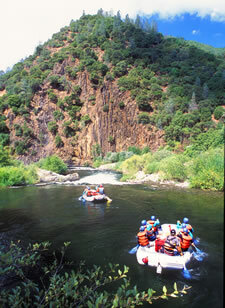 The North Fork American runs in early spring off the Sierra snowmelt and is best to raft in April and May.